What is a labyrinth? Well, it's not a maze. You can't get lost in it since there is only ONE path! There are many different patterns of labyrinth and North Country has recreated a number of designs such as the Medieval 11 coil of Chartres Catherdral. Thousands of people have walked them at Lindisfarne, Rievaulx and Whitby Abbeys, York Minister, Barton on Humber, Kiplin Hall and many other locations. How do you walk a labyrinth? There is no correct way to walk a labyrinth, you only have to enter and follow the path. Because there are no choices to be made your mind is free to wander and what you think about is up to you. Some people use walking meditation, others music, songs, quotations or poetry. You can use the twists and turns in the path to think about the twists and turns in your own life, it is entirely up to you. The path is longer than you might at first think and our designs include seating in the centre to allow time to pause, reflect and share you thoughts before winding your way to the exit. 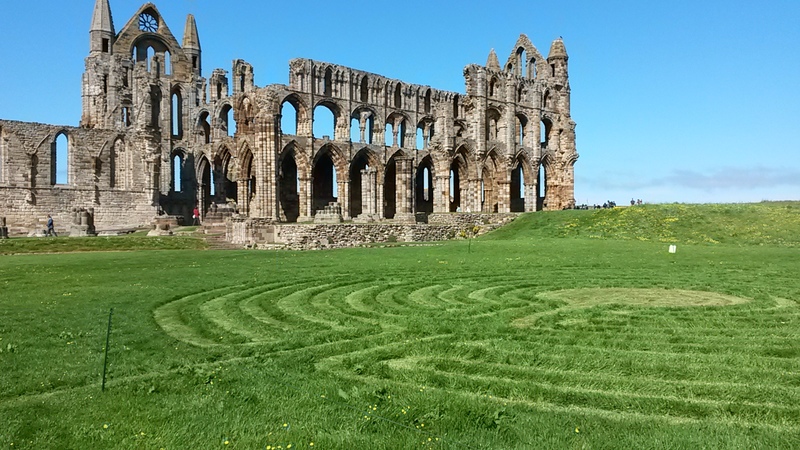 In 2016 visitors were able to experience our labyrinth at Whitby Abbey. Hosted by English Heritage, North Country actors Tom Frere, Richard Kay and Edward Darling invited visitors to walk the path whilst contemplating a brief quote, ranging from Shakespeare to John Lennon. As part of the Richmond Walking and Book Festival, we created a labyrinth walk based on the medieval pathway set into the floor of Chartres Cathedral. With monks, music, poetry and meditation this has proved one of the most popular events of the Festival. "What was fantastic about the Labyrinth was the many different ways that people used it, from the spiritual to the silly, the sublime to the ridiculous. Children as young as 3 toddling around it for sheer joy, thoughtful and barefoot meditators, exercisers power walking with stop watches, even a small group commemorating a fellow walker who had died that year. It was in every sense a moving experience." Labyrinths can be indoors too. We created another path at St Mary's Church at Barton on Humber as part of the Barton Arts Festival. Lute and Labyrinth - Friends of North Country Theatre event. The Friends Labyrinth at Hob Green was a fabulous event on a glorious afternoon in a delightful garden. Thanks to Wilma Burneston our host a Hob Green Hotel thanks especially to their gardeners who worked so hard to make the gardens ready for our visit. Due to competing with the England Germany world cup game we had fewer walkers than expected but we raised £175. Thanks also must go to Jacob Herringman and Susanna Pell our Lutenist and Viol player who donated their time. Friends may not have realised quite how privileged we were to have them for our event as they are leading international musicians.